The huge live area in Guillaume Tell Studio A retains many features of the cinema which previously occupied the space. 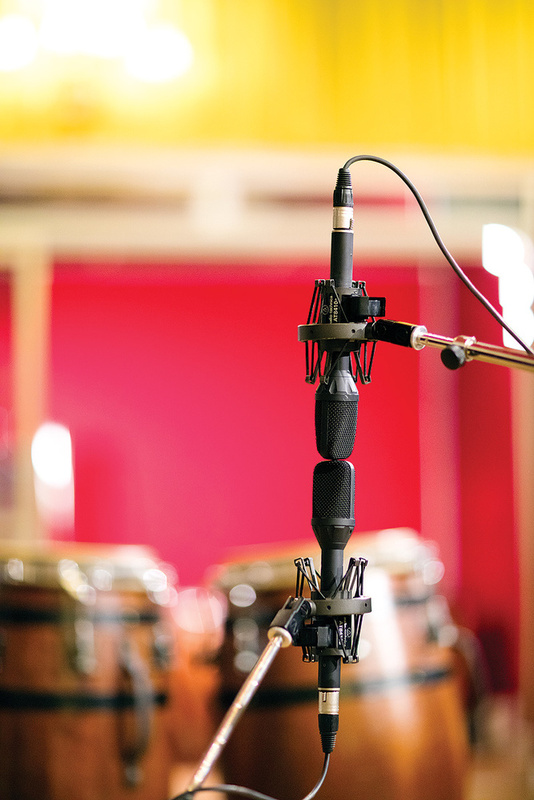 Some world–class studios are housed in purpose–designed buildings, but the majority of recording venues were set up in spaces originally conceived for other duties. Just like churches, movie theatres have proven excellent environments for crafting records. 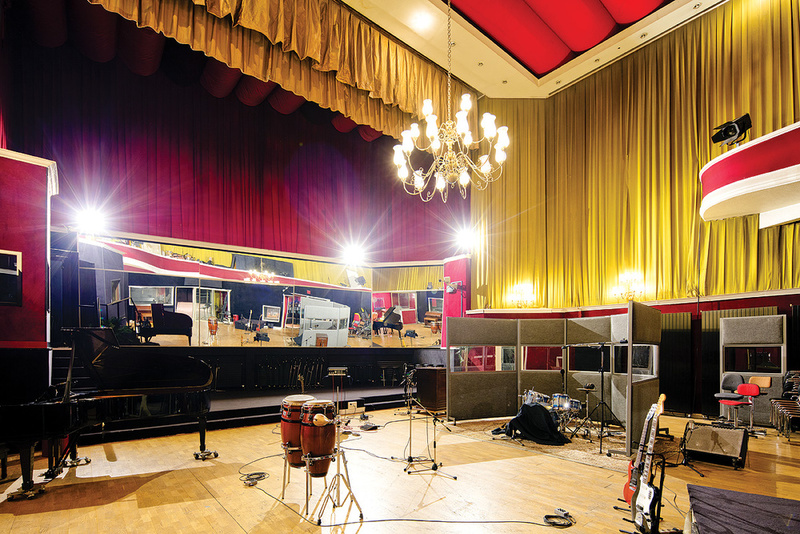 The list of top–flight studios housed in former cinemas includes Stax in Memphis, Tennessee and Atlantis in Stockholm, as featured in SOS November 2014, and the French capital is home to another. Guillaume Tell was opened in 1986, but occupies a building constructed as a movie theatre in 1930. Located in the district of Suresnes, just outside Paris on the left bank of the river Seine, opposite the Bois de Boulogne, the place offers quiet and privacy, yet remains within reach of the centre of the metropolis. Guillaume Tell was founded by French engineer Roland Guillotel, who started his career in the 1960s. In this era Guillotel worked on numerous projects with Johnny Hallyday, Nana Mouskouri, Michel Legrand and Jean–Claude Petit, amongst many others, before he founded his first own studio in the north of Paris around 1982 — a studio which survives today, under different ownership, as Studio Marcadet. 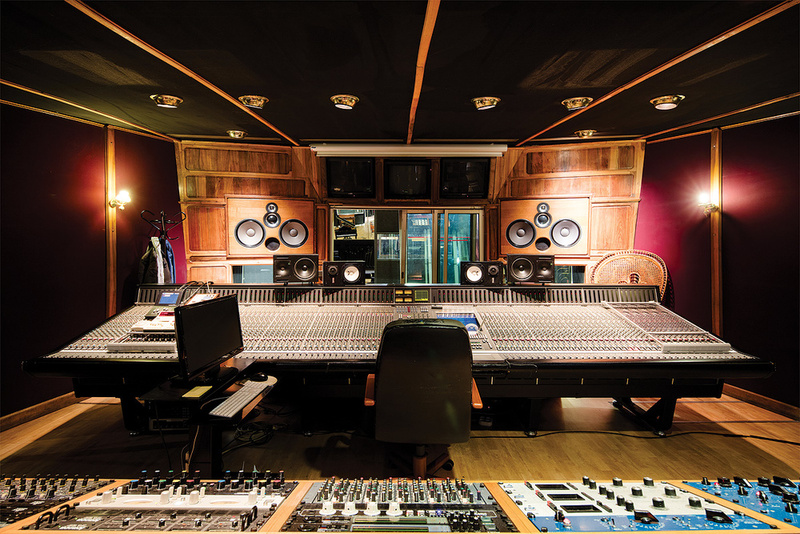 The Studio A control room houses one of the largest SSL J–series consoles in the world. Studio B’s control room is centred around one of few surviving Sony OXF–3 large–format digital mixers. As well as the huge main live area, Studio A also boasts four capacious booths. 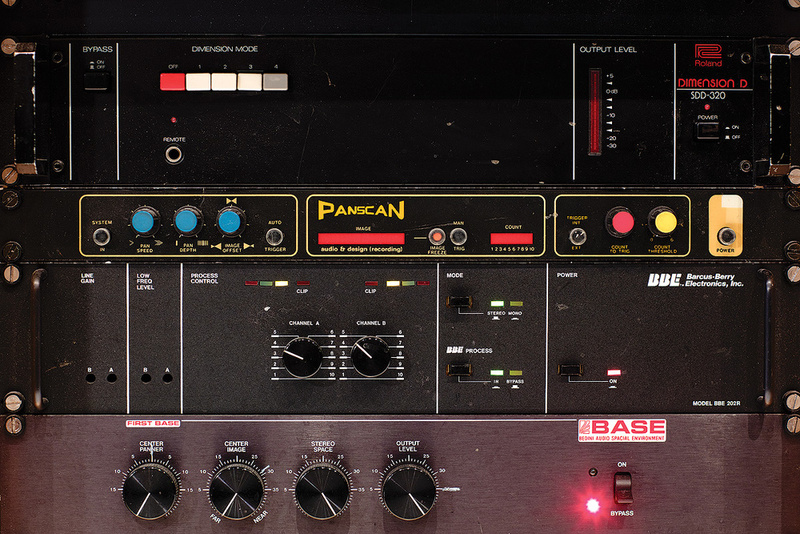 The outboard collection includes standards such as the Roland Dimension D chorus (top) as well as more unusual items like the ADR Panscan auto–panner, BBE 202R audio enhancer and Bedini Audio BASE spatial enhancer. With over 90 microphones in its lockers including these Microtech Gefell UMT70s, Guillaume Tell is well equipped for orchestral sessions. Studio A boasts a vast array of digital reverb and delay processors, including these Eventide, AMS, EMT, TC Electronic and Yamaha units.It was film composer Jean–Claude Petit, living nearby in Suresnes, who pointed his favourite engineer towards the abandoned movie theatre, which had closed its doors in the late ’70s. 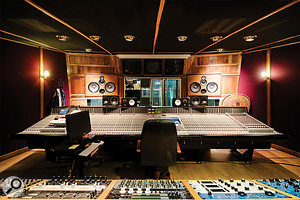 After some negotiations with the city authorities Guillotel was able to open up his second studio, which eventually would become one of the largest and busiest recording venues in France. Like its predecessor, it was named Guillaume Tell, a play on words combining the names of the studio’s founder and the Swiss folk hero. Most of the original interior was kept intact during the conversion, including the stage, curtains and drapes which lend the large Studio A live room its wonderful aura. The orchestra pit was separated by a wall to make space for the Tom Hidley–designed control room, while the balcony too was split off to create Studio B, which was completed in 1988, two years after the grand opening. With a floor space of 300 square metres, plus four additional booths and an impressively high ceiling, Studio A ranks among the largest recording venues in the world, and the mirrors behind the stage only add to the sense of space. 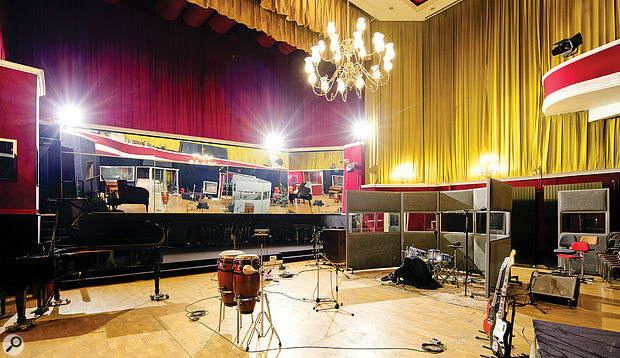 The plush, the chandelier and the original interior of the cinema evoke the charm of a different era, giving the room a rock & roll atmosphere which has attracted many well–known rock acts — perhaps most notably the Rolling Stones, who chose Guillaume Tell to record new original material for the Forty Licks (2002) and GRRR! (2012) compilations. 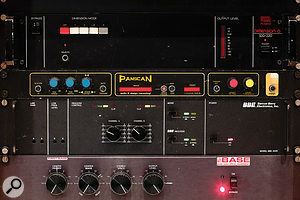 A surprisingly small window connects the live area with the control room, which is centred around a Solid State Logic 9096 J–series console. 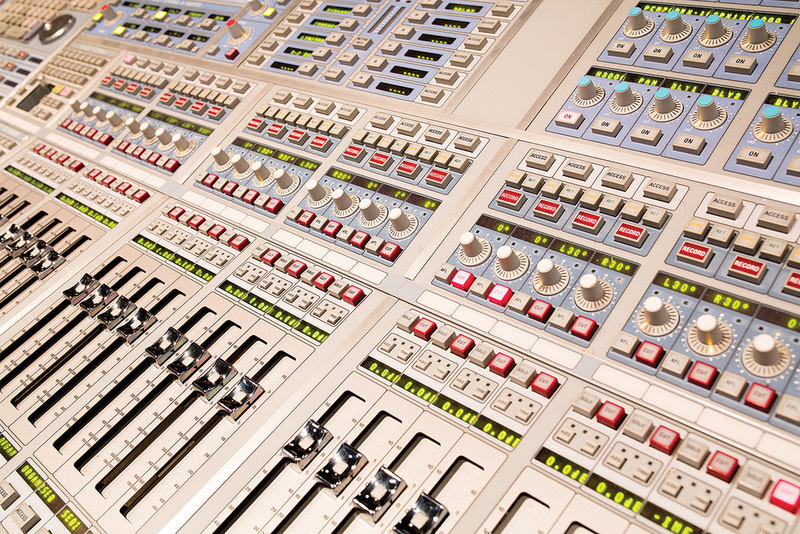 With 96 input channels, Guillaume Tell’s is one of the largest consoles of its kind. 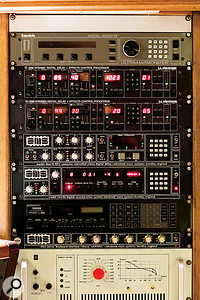 Interestingly, the outboard collection still reflects the era when the studio was built. The credenza, with its unusually slanted configuration, holds a number of Tube–Tech units like a pair of PE1Cs, an ME1A and an MP1A, whose worn surfaces tell the story of almost 30 years of cutting records in this location. They are accompanied by a GML 8200 EQ, a number of silverface UREI 1176 limiters and some Drawmer, ADR, dbx and BSS dynamics units. 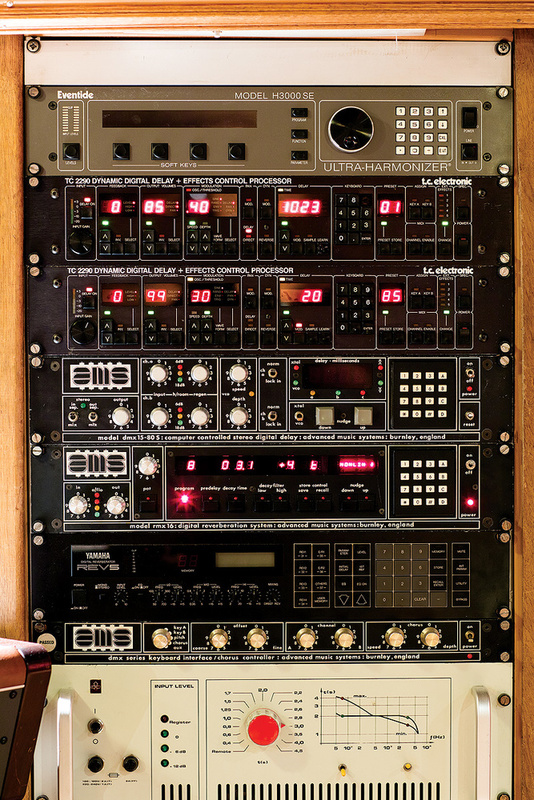 Most eye–catching of all are Studio A’s pair of EAR 822 tube EQs and 660 limiting amplifier, an early model which sports a noticeably different — and much simpler — visual appearance than its current–production successors. There’s also a huge array of reverb and delay processors, including Lexicon 224XL, 480L, PCM42 and PCM70 units as well as an EMT 244, 245 and 252, a pair of AMS DMX16s, a number of AMS DMX 15–80s and a pair of TC 2290 delays! The instrument collection includes a Steinway Model B and several other keyboard instruments such as a Hammond B3 with Leslie, a Fender Rhodes and a Hohner Clavinet, along with ample percussion including timpani, tubular bells, a vibraphone and many smaller instruments. Studio A can host up to 80 musicians at a time, which is reflected in the vast numbers of headphones and microphones available: Guillaume Tell boasts not only the ubiquitous Neumann valve classics, but a healthy collection of small–diaphragm mics by makers such as Neumann, Schoeps and Bruel&Kj er. 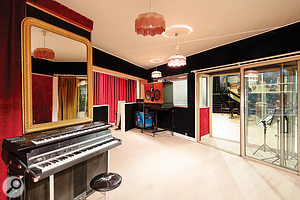 At 30 square metres in size, the Studio B live room is similar to one of the Studio A booths, indicating that this space was designed more for overdubs, mixing and additional production. 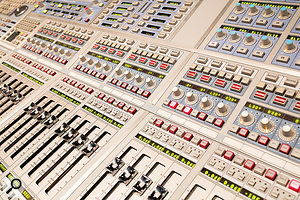 It offers one of the few remaining Sony OXF–3R digital consoles in operation, and it boasts an outboard setup similar to the one in Studio A.
Guillaume Tell is one of the major recording venues for film soundtrack recording in France, and notable scores to have been recorded there include Cyrano de Begerac, Intouchables, Quai d’Orsay and Prêt–à–porter, just to mention a few. One of the first international artists recording at the studio was Prince, who crafted portions of his album The Gold Experience here, and he was followed by Depeche Mode and Elton John. Naturally, the client list also reads like a Who’s Who of the French music scene, with Charles Aznavour, Bernard Lavillier, Serge Gainsbourg, Juliette Gréco and Stéphane Grapelli being only few examples. More recently, Iron Maiden and Eddy Mitchell have recorded and mixed albums at Guillaume Tell, and among the latest projects is a collaboration between French singers Charles Aznavour and Zaz, backed by the Quincy Jones Orchestra.